Chrome plated Japanese steel scissors, available in a selection of sizes starting from the price shown above. Japanese steel blades with a jet black finish, available in a selection of sizes. Highest quality Japanese steel scissors with a strawberry gold finish. 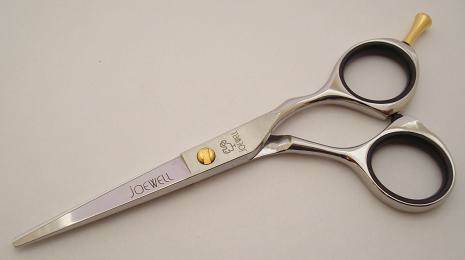 Japanese haircutting scissors, polished finish. Highest quality Japanese steel with a pink aesthetic. High quality Japanese steel scissors. Offset Japanese steel scissors with a polished finish. Highest quality Japanese steel scissors. Joewell FX Pro Black Titanium, pink, offset, 5"
Highest quality Japanese steel with a stylish black aesthetic with a pink jewel. Joewell FX Pro Black Titanium, blue, offset, 5"
Highest quality Japanese steel with a stylish black aesthetic with a blue jewel.